How to Overcome Self Doubt about Pursuing a New Career? The virus of fear is almost in every living body and being cold feet before doing something is a very common thing. When someone hesitates or gets anxious before talking to other person then it somehow is a sign of ants in the pants, this sounds funny but being nervous can ruin the first impression of anybody. Talking about the disquietude on first day at the job, it is almost like first day at the school, but it is a must saying that even if the person is chicken hearted, he must go well prepared because sometimes when the same horrified person gets all his courage back his day can be saved by his preparation. It not only happens with the new comer but also with the experienced well settled in job people even get these fears, so we can say it a normal thing. Some of the fears are unknown and some are known but there is always a way to conquer them, so it is very important that to fit into a new job one must be well known about the culture of that organization. 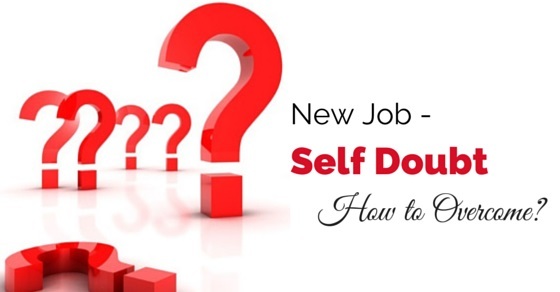 New Job Self Doubt – How to Overcome or Conquer? Before joining one can be in regular touch with the boss who can tell you better about your job according to the designation and can even keep you update about what all should you be prepared for before joining. This way one can get easily that what exactly is his or her boss asking from his work and also being in contact with the boss helps in achieving the goals in better way on the first day. This can do a lot more to understand the job even before joining. Talking to the colleagues on the first day can also guide you about the office about its working, about the work load and the culture. But one should keep in mind that talking to the co-workers should be to the point, keeping in mind not to take their much time and ask them only the questions you need the answers for, until unless you become the part of the organization. Being too frank on the first day of the job can ruin the impression on the co-workers. To be concerned about the job should be the very first preference as it is always said that “First impression is the last impression”. Indulging in your work on the first day will assist you not only in understanding the job but will also help you gain attention of being a dedicated worker in the eyes of the boss as well as co-workers. Avoid fussing around in the free time and best thing is to keep yourself as busier as you can. Focus on the work only. Focusing too much on the work does not mean cutting off with the surrounding totally. Making good friends around can benefit a lot, as they will guide more about the job. But again showing too much of enthusiasm will only make it worse. Create good and meaningful conversations and especially on first day prefer listening more than speaking. At such places a person should always think before speaking. In the excitement of getting job never forget your personal routine. Always attend your extra curriculars even if your schedule is hectic or you have very less time. If you play an outdoor game, do make some time for it, if you read books before going to bed, continue with the routine, never let these activities go off your list. Give them as much importance as they were given before joining the office. Firstly and commonly they keep you fit or your mind fresh, secondly helps release your office tension. As stated earlier that being too much enthusiastic can ruin your day so one should know well how to control the fears. Blabbering too much should always be avoided. But sometimes it is not only being nervous, it can also be about the job being hectic, where one should never give up, accept it as a test and work it out in a harmonious manner. It is the way of testing your patience with the job that makes your boss understand your strategy and to know if you can handle it well. When you are new to some place, you should definitely speak less and listen more. In the new workplaces avoid participating in the discussions first because involving too much in the new group can make you a big no-no in the future, in short the co-workers don’t like the blabbering new comers. Sometimes they can even backfire at you. New person at the work may not know this but talking too much is irritating for the already working employees and it reflects bad image of the new person. Remember when you were born, the world was new to you, but now you are so much into the surrounding that it has become habitual for you to be in it, basically you adjusted well. Same is the case with the office. It will always be never the same, meaning if you are new to the work today then tomorrow or day after tomorrow it will become a “second nature” to you. Being used to something takes time but at the end it becomes the part of the life. The unfamiliar today will be familiar tomorrow. The first day at the office is similar to the first day of learning something new and scared of failing is common. Keep in mind that you are there to learn so one should keep asking about the things you don’t know because this can help understand the things in a better way. Learning takes time, so one should never be in a hurry to learn everything on the first day only, everything comes with time. Working in a relaxed manner and doing only the assigned work can aid in overcoming the uneasiness. It is always said that to overcome one’s fears the best way is to think positive. If your thoughts are good, your deeds are good and if your thoughts are bad it simultaneously will affect your work. Never give up when you are working and always have a feeling of that you are the best , in these cases be enthusiastic. The words “what if” can downgrade your work. Everyone has to start from somewhere, so one should always work hard but with the free mind. The first day at the job does make every individual nervous but as said earlier that going being prepared can help a lot more and it is often that once the person gets used to something it becomes easier to work and fit in. Yes it sounds insane but it is true, seeing your fears as an ally can help you know them better and it can make easier for you to win over them. It would be useless to run away from your fears because they actually are good teacher, good motivators and can teach you better lessons in life. The moment you realize that your fears can teach you better they become good friend of yours and you fear them no more. The best way to quell your fears is embracing them. This very much is true. A person is afraid of the things which he wants the most. The fear of losing it before getting it, the fear of great responsibilities, the fear of facing someone, fear of taking a stand but facing your anxiety brave heartedly will make you chivalrous. The fears are not always negative they can be for something happier too like gaining the power. Though it is difficult to face the distress but there is always a way out if there is a way in. As discussed above everyone has a phobia whether it is of heights or of driving or as this piece is about the first day at the job. Apart from facing them it is very important to know that running away from your fears can only make it worse but if you have the courage to face them then you can easily bring your nightmares to the knees. We all know that our body is controlled by our mind so is same with the fears. It all depends on you that how you handle your anxiety. Always be a creator of your own career destiny.